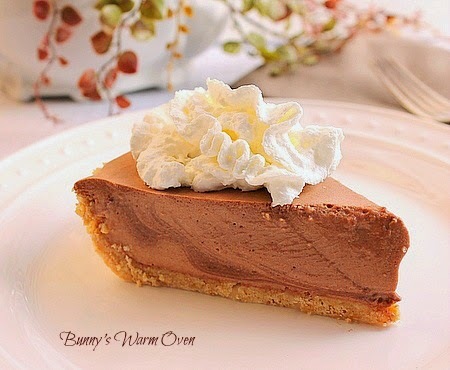 Chocolate Bavarian Pie...a smooth chocolate taste with a crunchy graham cracker crust. Amazing! This pie is cool, smooth and luscious. But that's what happens when you mix cream with chocolate. A Bavarian cream is a cold custard made with cream,gelatin and various fruit purees or chocolate. You could make this with a pastry crust as well as a graham cracker crust. I choose graham cracker for the crunch factor. This was a very easy recipe, I made the graham cracker crust first and let it cool. The Bavarian filling was simple to put together, the longest time period in the recipe was waiting for the cooked chocolate filling to set up into a... mounds when dropped from a spoon consistency before adding the whipped cream. The recipe says, let the chocolate cool until almost set. I've worked with gelatin before , the best way to describe when the gelatin is set enough, is when it mounds when dropped from a spoon. You can make this a frozen treat by simply putting the finished pie in the freezer for 4 - 6 hours or overnight. Take it out of the freezer and let sit 10 to 15 minutes before cutting. You can make this recipe using little tarts or layer the filling in parfaits. Whatever form you choose to serve it, this is one luscious treat you will LOVE!! Enjoy! 3. Beat whipping cream in small bowl on high speed of mixer until stiff. Beat chocolate mixture on medium speed until smooth. On low speed, add whipped cream to chocolate mixture, beating just until blended. Pour into prepared crust; refrigerate* until set, at least 3 hours. Just before serving, drizzle each pie slice with chocolate syrup. Cover; refrigerate leftover pie. 8 servings. Wow that pie looks delish! Big Q here..after the chocolate mixture cools in the fridge..are you wanting it removed from the fridge and mixed up a second time?...before adding the whipped-up topping to the chocolate? Thank you. Your recipes are delicious! HI Lisa! Yes you will beat the chocolate just a little bit until it's smooth, then you will whip the cream to stiff peaks and use the mixer again ( with the mixer on low)to beat the whipped cream and chocolate together, but only until just incorporated. Let me know if you make it, I'd love to hear what you think! This pie looks and sounds amazing, Mary! I think this would be great to serve at Easter dinner this year! Thanks so much for sharing your recipe! This is one of my favorite recipes! The chocolate and the cream together...sooooo very good! Thank you Debi!